Based on the lathe designed by Rude Osolnik, the Jet 3520B is the European version of the very popular Powermatic 3520B in America. This lathe has been on the market for some years now and has developed a loyal following of users. I had been looking for a new lathe for my workshop in Argyll and finally settled on the 3520B. It has been in my workshop for about a month now and I have used it on a variety of projects. This is a solid piece of kit. Weighing in at 326kg the first problem I had upon its delivery was moving the parts from the drive into the workshop! Gravel paths and pallet trucks do not mix so if you do decide to buy one of these machines, give some thought to its delivery. Fortunately the lathe arrived, in heavy but manageable pieces. The legs are packed in separate boxes with the head, tailstock and banjo all attached to the bed. Everything is well protected with plenty of polystyrene, and with assistance it made this process safe and easy. On initial inspection the individual parts appeared to be very well made. I soon realised that this substantial piece of equipment required a very solid base on which to stand. I have poured four concrete pads for the feet to stand on, as I found the double thick timber floor I had was not rigid enough to take its weight. The castings are of a good quality and the bed looked superb - very flat and level. Attaching the legs was achieved with the aid of a couple of saw horses and an Allen key - not supplied. Legs are attached to the bed using three bolts. The lathe is then levelled using the adjustable feet which bolt onto the base of the legs. Once levelled and tightened the next task is to lift the headstock onto the bed. This is not a one person job; the headstock is very heavy and needs two people to guide it into place. It is worth pointing out that the legs are not the same. One of them has holes drilled and tapped to take the optional auxiliary bed. Get them the wrong way round and you will find yourself having to dismantle your lathe in order to turn the legs around. Don't ask me how I know this! In addition to the legs, the Jet is supplied with a bolt on tool storage rack and a heavy wire guard that is designed to prevent large pieces of bark or loose wood from flying off and causing injury. 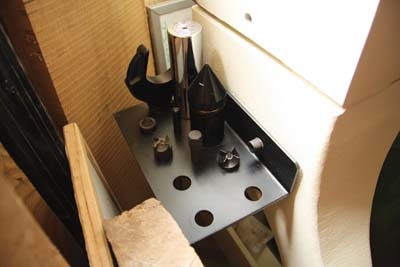 The tool storage rack comprises a thick metal shelf which bolts to the leg outboard of the headstock end of the lathe. It is drilled with holes that accept the various attachments; these include a knockout bar, four-prong drive and a spanner for removing the small faceplate. There is a pin to work the indexing system and a large revolving multi head centre. Also included is something called a comparator which is designed to aid copy turning spindles. This comprises of two dead centres which slot into a bracket situated at the rear of the head and tailstocks. They allow a finished spindle to be mounted directly behind the piece being worked on, giving the operator an easy way of checking that the spindle being turned is the same as the original. Everything about this lathe is heavy duty; this is a very heavy well-made machine with ancillary equipment that was also of an excellent quality. The headstock has a large digital speed readout in rpm (revs per minute). There are three main controls on the headstock: a pull on push off switch, a forward and reverse toggle and the variable speed dial. There is also a spindle lock button and a hinged panel which gives the user access to the two belt positions - 50-1,200 and 150-3,200rpm. Belt change is achieved by releasing the locking handle and manually lifting the 2HP motor up which releases the tension on the belt thus allowing it to be moved. The spindle is 2MT, M33 x 3.5 and around it there are a series of threaded holes which are used for indexing. Another very useful feature of the lathe is the included remote on/off switch. 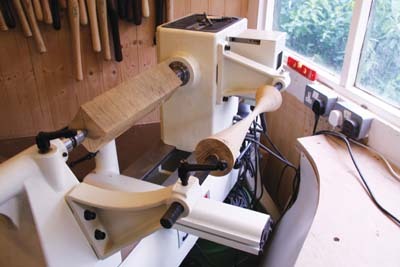 This has a magnetic backing which allows it to be attached anywhere along the lathe bed. 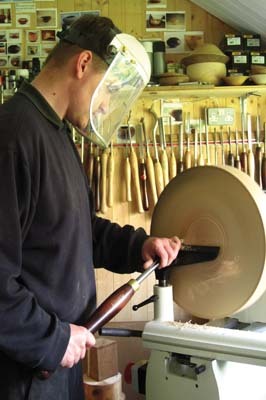 This is a great feature as when working on larger pieces or hollow forms, the lathe can be stopped by leaning against it. It also removes the need to reach around a rotating piece of wood to turn off the lathe at the headstock switch. The banjo and toolrest are very comfortable to use. The banjo locks both to the left and right very solidly and the toolrest is very comfortable in use. For smaller work it is quite long - 460mm (18in) - but a smaller 150mm (6in) rest is available as an optional extra. The toolrest has a stem diameter of 25mm (1in) however, the banjo is designed to accept smaller diameter posts. In addition, the locking handle for the rest can be positioned in three ways ensuring that it does not foul the handle of your tools. The 2MT tailstock is another mighty piece of casting with a quill travel of 100mm (4in) and a polished chrome hand wheel that is a joy to use. The revolving centre included is very well made, if a little on the large size, but it unscrews to reveal a removable hollow point and ring centre which will cover most turning applications. 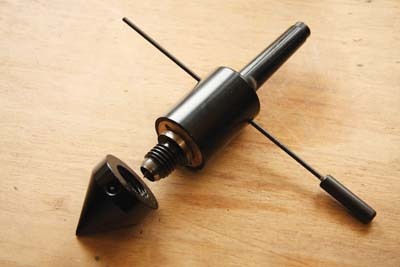 The threaded area on the centre provides the user with the opportunity to create other revolving heads and is a very useful inclusion in the lathe package. The locking mechanism on the tailstock is positioned under the left hand side. This allows the tailstock to be locked off whilst a large portion of it overhangs the end of the bed; a useful feature if the spindle being worked on is just that little bit too long. One other nice touch to the tailstock is the storage compartment. The bed has two removable pins at each end of the bed which prevent the user from sliding the tailstock or headstock off the end. It was very pleasing to find that the kiss test showed a perfect alignment between centres and again hinted at the great quality of this machine. I mounted a piece of 100 x 100mm (4 x 4in) elm (Ulmus procera) between centres, set the belt to its higher speed setting, checked the position of the speed dial and switched the machine on. The first thing I noticed was how quiet the machine is. The digital readout is clear and informative. There was absolutely no vibration, just the mild hum of the motor and the swish of air as the square blank rotated. Increasing the speed of the motor hardly changes in pitch or volume; the only noise came from the increased air flow from the motor's fan. I was quickly able to rough down to a cylinder and begin to shape. The length of the toolrest meant that I didn't have to keep moving the banjo and it was good to find there was no vibration, even when working at either end. Overall, the spindle turning experience was very good; the speed range was excellent and the motor provided me with plenty of torque. Being able to reverse the motor and slow it right down with a quick twist of the dial gave me a great finish when sanding. One drawback of the variable speed dial is that it is easy to twist it further than required, thus speeding the lathe up far more than is safe on the top speed range: 150-3200rpm. It takes very little movement of the dial to go from 700rpm to over 1,500, but obviously, with experience, it is something you get used to. I then decided to try out the largest bowl blank I had - a piece of sycamore (Acer pseudoplatanus) that measured 400 x 90mm (16 x 3 1/8in). For this test I decided to remove the tailstock and slide the headstock along so that I could work off the end of the lathe. This was easy and quick to do and meant that I was able to work on the blank without having to lean over the bed, making the experience much more comfortable. 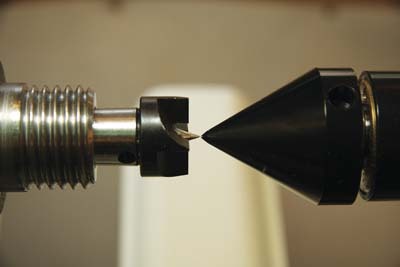 Whilst other lathes offer a swivel head to allow this kind of approach, a sliding headstock removes the potential problem of realigning centres. Admittedly workspace needs to be organised to allow sufficient room to work at the tailstock end; however, my shed is only 3 x 3m and due to the compact bed length, I can comfortably work at the tailstock end. The blank was slightly out of centre when mounted on the lathe but again the variable speed set to the lower range (50-1,200rpm) was perfect, as I could easily adjust the speed to eliminate any vibration. One issue I did notice was with the spindle lock button which has to be pressed in manually in order for it to engage. This ties up one hand and made simple tasks such as attaching a chuck or screwing a blank to a faceplate more complicated. However, it does remove the danger of starting the lathe with the lock engaged. Coming to the lathe as someone who has never had a spindle lock, I didn't find this to cause a problem. Available as an optional extra the bed extension is another very heavy bit of kit. It is designed to do two things: firstly to extent the overall length of the bed by an additional 460mm. Secondly, sliding the headstock along to the tailstock end of the bed and attaching the extension to the lower holes in the leg of the lathe turns the machine into more of a pedestal lathe. Included in the extension kit is a riser for the banjo which means that the toolrest can be used as normal but allows for a huge 915mm (36in) swing. The lathe is able to cope with such massive pieces of work and this puts it on a par with far more expensive machines. Attaching the bed to the leg of the lathe is something of a challenge due to its weight; it would be much easier with two people. However, it is achievable with one. I mounted a piece of elm burr that was too large to swing over the main bed. The extension bed performed flawlessly: there was no flex or vibration and the extension piece for the toolrest was simple and straightforward to use. 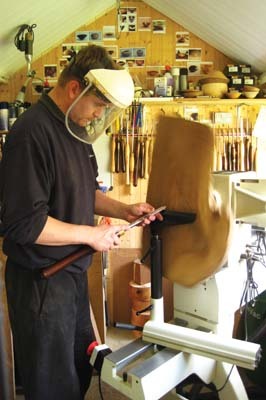 Freestanding toolrests are also available allowing pieces the full distance from floor to spindle to be completed. I also wanted to see what the difference to the overall bed length would be if I attached the extension bed. Again, I had difficulty in actually holding the bed in place and screwing in the bolts, but what was even more difficult was aligning the extension up with the bed so that the tailstock would slide easily along the full length. This was very tricky to do but I imagine that after a few attempts it would get easier. Also, on the underside of the extension bed there were areas where the paint finish was thicker than others, which prevented the tailstock from traversing smoothly. Some quick work with an abrasive and this was eased. Once connected, however, the extra 460mm created a great platform to work on those longer projects. 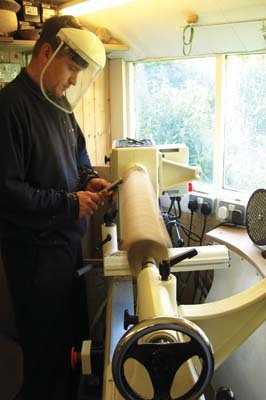 Ultimately, I am glad that I chose to include the extension bed as I can see that it provides the lathe with even more options. The Jet 3520B is a class act. Its weight, stability, power and overall build quality suggest a machine that will last for a very long time. With its sliding headstock, bowl and hollow form turning is pleasurable as pieces can be worked on from the tailstock end, removing the need to lean across the bed. The bed is a great length: not too long that the lathe needs a massive amount of space, and not too short to be of much use. Power is delivered smoothly and constantly. It is very quiet which over a few hours' turning makes for a pleasurable experience. The component parts appear very well made and the lathe is extremely solid. In use there is no vibration; its capacities suggest a machine that will be tricky to grow out of. Like every lathe there are small niggles to get used to: the spindle lock and sensitive speed control in my opinion being the worst offenders. However, these are tiny issues that are easily overcome through use and experience. The weight of the component parts, such as the tailstock, have to be considered too. Everything about this lathe is heavy duty and whilst this mass is superb at dampening any vibration if lifting bits of it, you do need to be aware of the weight. A quick search on the internet, however, hints at many homemade and commercial solutions to some of these issues such as hinged platforms for the tailstock. The guard is a valuable inclusion too as it provides very good protection in the case of a piece of wood becoming airborne, although it doesn't replace personal protective equipment. All in all, the lathe is a fantastic machine and thoroughly recommended. In the short time I have had the 3520B it has been a joy to use, dealing with small and large pieces of timber without complaint. My biggest problem was finding an Allen key to bolt it all together! I think that given the overall cost of the machine, it is something that could easily be included. In summary, this is a great lathe.